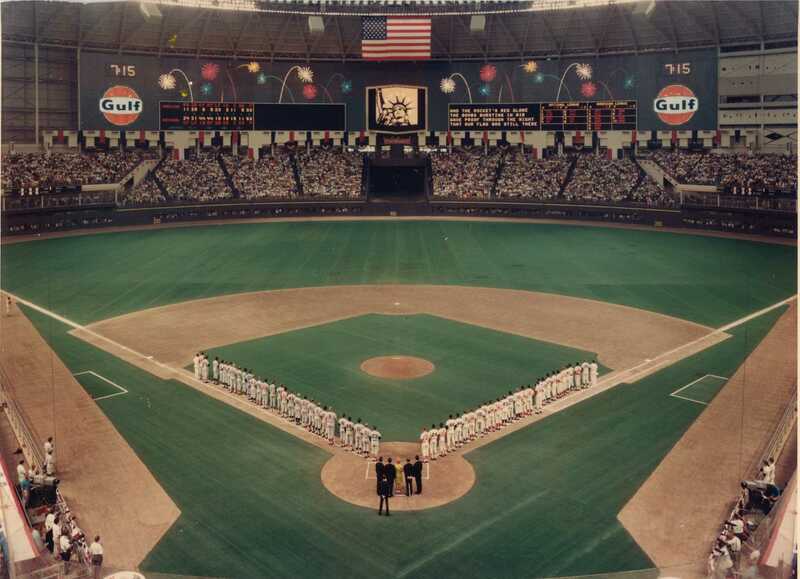 It was fifty years ago today- July 9, 1968 one of baseball’s showcases- the Major League All-Star game took place at The Astrodome in Houston, Texas. 1968 has been billed as The Year Of The Pitcher and the All-Star Game that year was typical of the season. The National League won 1-0. Back then decades before inter-league play the only time the leagues met were in spring training games, the All-Star Game and the World Series. It was something special when they did meet. The players back then wanted to win badly for their leagues and they played hard. A lot was on the line. This particular All-Star Game is interesting for a number of reasons- it was the first All-Star Game played in a dome and on artificial turf. It was also the first All-Star Game to be played at night since 1944. In 1969 they played during the day only because of a rain out the night before- since 1970 all All-Star Games have been night games. In 1968 the All-Star teams were selected by the major league players. In 1970 it would go back to the fans vote and has stayed that way ever since. The starting pitchers that night were Don Drysdale of the LA Dodgers for the National League and Luis Tiant of the Cleveland Indians for the American League. The only scoring came in the bottom of the first inning. Originally Willie Mays hadn’t been voted into the starting line-up but an injury to Pete Rose who had been voted as a starter- put Mays into the line-up leading off for the National League. He got a single. Tiant tried twice to pick him off of first base and he had Mays caught off first with the second throw but the throw was wild and Mays was able to advance to second base. Curt Flood walked, then a wild pitch sent Mays to third. Willie McCovey grounded into a double play and Mays scored giving the National League a 1-0 lead that would stand for the rest of the game. Mays would win the games MVP Award- becoming the first player to win the award two times. This is the only All-Star Game that didn’t have an RBI in it- you don’t get an RBI it you hit into a double play. The final totals would be AL 0 runs 3 hits and 1 error- National League 1 run 5 hits and 0 errors. Don Drysdale the winning pitcher- Luis Tiant the losing pitcher. Jerry Koosman got the save for the National League. 48, 321 were in attendance that night at The Dome. The game was played in 2 hours and 10 minutes! The National League was in a streak of dominance back then- clearly the superior league. Winning one game of course does not mean dominance but from 1963-1982 the National League beat the American League 19 of 20 times. The only American League win was in 1971. This was the first All-Star Game I ever watched. The one thing I remember most about it- was the injury to the Twins Harmon Killebrew. Killebrew was playing first- a wild throw by shortstop Jim Fregosi had Killebrew stretched out to get the ball and he tore his hamstring. At the time it was feared that it could be a career threatening injury but Killebrew- who by the way was legendary as one of the nicest players in the game– was able to come back and play in September. The most dominating pitcher of 1968 Bob Gibson who would finish with a 1.12 ERA- didn’t pitch in the game. He had pitched the Saturday before the Tuesday game against fellow All-Star Juan Marichal- the manager of the NL was Cardinal skipper Red Schoendienst- Marichal appeared in the game. I wonder if Red was just taking care of his pitcher? Today it is easy to forget that in 1968 The Astrodome- the first domed sports stadium was considered a marvel. It had opened in 1965- and was called the “Eighth Wonder of the World.” It would take a decade or so for the newness to wear off and by the 1990’s it was obsolete but once upon a time it was a wonder- and much talked about. If any place though needed a domed stadium it was Houston. I went to one game there in July 1992- it was so nice to go inside and out of the heat. It did feel like watching a baseball game in a huge movie theater though. Another note – In reading up on that 1968 All-Star Game- I came across something the famous baseball writer Leonard Koppett wrote- he was writing about how the 1968 game lacked the star power of say the 1933 game which had 18 future Hall of Famers in it. As it turned out there are 17 players who were all stars in 1968 who are in the Hall of Fame- and there could be an 18th- I think Luis Tiant still has a chance to go in via the Veteran’s Committee. I just find that funny because it seems like in baseball- it was always better back in the day- I hear mostly Grumpy Old Men complain about how the players of today don’t measure up to the 1960’s and 70’s etc… well here was Koppett saying the 1960’s players didn’t measure up. The truth is there are as many great players today as there ever was. When I think of the Astrodome I think back to the not as good as the original movie Bad News Bears Breaking Training that I saw in the theater… The bad part about the artificial turf was it hurt a lot of players and may have shortened their careers. It is easy to romanticize about past players…especially childhood heroes. Time makes them better than they sometimes were… and I’ve always thought you need to compare players to their peers in their era rather than compare them to modern players. Modern players are much better conditioned because they don’t have to be shoe salesmen in the offseason anymore…They train year round. But yes you have a good point…every generation does it. I agree you can’t compare Walter Johnson to Clayton Kershaw totally different eras not even close… I see some people name their all time team and have no one who was in their prime in the last 50 years… I also think folks think of when they were young and new to baseball and those players were always better than the current ones… I have been watching baseball since 1967 while I would rank Bonds as the greatest player I’ve seen before it is over Mike Trout could be the one. I was shocked when I saw this is his 7th all-star game! Trout just does everything well. He does have great fundamentals and so did Bonds. I agree it’s more about power… All the same, if you stepped into a time machine and went to a game in 1955 and then go today…it would be basically the same game by sight. That is what makes baseball special. Football would be completely different in both looks and the way they played. It is frustrating to see a man on third with no outs and not to score. Sometimes all it would take is to make contact and not to try to hit it out of the park. the new metrics but a blunt isn’t always a bad thing. The one new ballpark that blew it was the New Comiskey- right before Camden Yards. They started talking 5 years later about a new ballpark but that’s not happening.. Yes I agree on that one. It is pretty bland…I forgot about that one. If they had only waited a year or two longer… I guess it’s 25 years or so now- maybe they will get one by 2030. It looks like common sense would have kicked in…they compete in a way to a very historic ballpark. The park is just there…about as much charm as Candlestick had…with no history. I am shocked Luis Tiant is not in the Hall of Fame already. I am hoping he gets while he is living- so he can enjoy it. He deserves to be in!